STOP doing these THINGS that DO NOT ignite your body’s own fat- burning capability. Get stronger, leaner and carved out abs quicker and faster by following a higher intensity core and compound exercise program. As a Personal Trainer, my job is to get my clients from A to B with the most effective exercise, nutrition and mental game that is available. The old school notion that stepping up on a treadmill, or any cardio machine for that matter, or pounding the street for long periods of time in trying to lose weight and get super fit are gone. Having said that, if you are training for a distance run, then of course these types of programs will aid you in your cardiovascular capacity. But for the rest of us, just trying to lose weight, get a more lean and toned body, these type of exercises are very inefficient at keeping you in the fat-burning zone for the longest time possible. When doing cardio work, try to keep in mind that the intensity, NOT the duration is the golden key. Try doing this for the next 30 days. When you get on a cardio machine, you will need to set your GYMBOSS up to this program. Duration: 30 minutes to 45 minutes. (start with what you can realistically do to challenge your body). I prefer you to use a CYCLE, ROWING MACHINE or CROSS TRAINER ( Ellyptical). 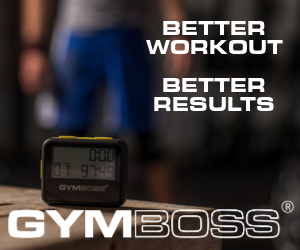 Start by setting your GYMBOSS to the desired time. Lets take 30 minutes. For the first 45 seconds you will go at a slow to moderate pace following good form and technique. From 45 Seconds to 1 minute, (15 seconds) you will be going at FLAT OUT SPEED. From 1 minute to 1 minute 45 seconds you will drop back down to slow to moderate pace. From 1 minute 45 seconds to 2 minutes, you will go FLAT OUT once again etc. So set up your GYMBOSS like the above at 45 seconds, Rest period is 15 seconds, FLAT OUT, minimum 30 minutes, Beep High and Beep Twice. Unless you are a bodybuilder looking to gain size, stop doing isolation exercises. The truth of the matter is that for efficient fat-burning ability and calorie expenditure, isolation exercises just are too inefficient to get to the level that we need to really burn calories. If you want to build lean muscle while burning fat, you can get some serious definition going on. we need exercises that stimulate as many muscles as possible and expend as much energy as possible at the same time. This is were Compound exercises, HIIT TRAINING, MRT TRAINING and the EXTREME AFTERBURN come into play. All of these type of programs are here on the site in the Advanced Gold Membership area and you should be well on your way toward getting that lean ripped body that you are after. STOP working out on machines. Back when I was training to get some size and before I became a Pe3rsonal Trainer, i used to always workout on exercise machines. After a year or so of doing this, I was starting to experience some joint discomfort and started having to use deep heat treatment on my joints before my workout. The problem with machines is that they are not very functional. When I say functional, I mean that they don't mirror natural body movement and function. Machines limit the bodies natural movement and have since, as a Personal Trainer, tried to keep my clients off of exercise machines in the gym environment. It's important that you incorporate exercises that allow your body to move naturally with a full range of motion as to skyrocket your metabolism and tone your entire physique at the same time. Again, the Compound exercise route is a much better and more efficient way of getting from A to B in the quickest time possible.